At Precious Puppies we only offer the healthiest, most gorgeous, top quality puppies found anywhere. The puppy’s health is our number one priority. All of our puppies are vaccinated 3 times, dewormed 3 times and have received a physical vet check before going to an approved home. Not only does this save you money, but gives everyone peace of mind that their puppy has been properly immunized against many viral infections found in the Greater Toronto Area. A happy puppy is a healthy puppy. All the puppies offered by us are ethically raised in a well socialized environment to prepare them for the transition when they are going to their new homes. Our healthy puppies will make all the difference in the years of joy, fun and laughter that your new companion and you will spend together. We can not be held liable and/or accountable for any veterinarian expenses that you may incur should you take your puppy to a veterinarian for any reason whatsoever without first contacting us. All of our puppies are in excellent health both mentally and physically and we strive to provide a loving, caring and healthy environment for all our puppies. We attempt to estimate the weight of each puppy as accurately as possible based of many factors, they are meerly estimates. 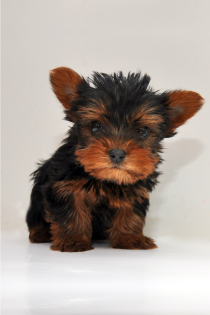 Thank you for visiting Precious Puppies – home of the highest quality Yorkie and Morkie puppies available for sale. Our goal is to provide every individual with the best new puppy experience possible. Once a puppy has been adopted from us, we begin to work for the new owner of that puppy. We will provide all of the knowledge that we have acquired over the last decade to help you raise your new friend. Whether it is 3 o’clock in the morning or 3 years from now, we are always happy to help your companion and you, whatever the situation may be.